Beggars Pizza Bolingbrook and Glitter Your Pallet are pleased to offer a BRAND NEW PROJECT! 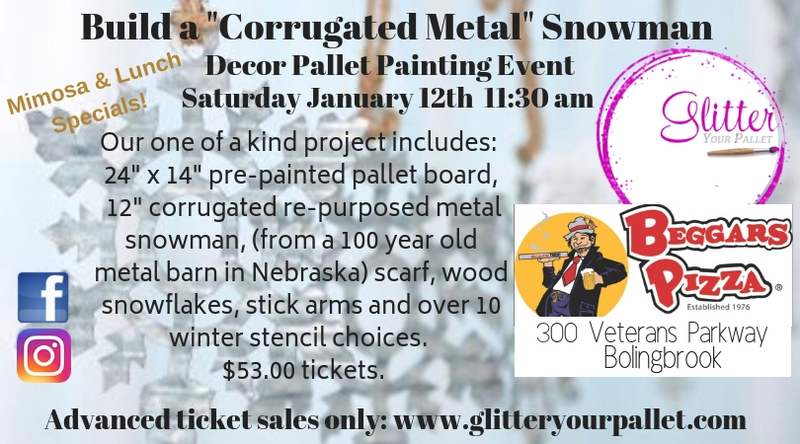 Come build your very own corrugated metal snowman! Join us for the snowman event on Saturday morning January 12th, 11:30 am. The room is light and bright. It’s perfect for a morning mimosa and painting! HUNGRY? Lunch specials will be announced. A full menu will be available for purchase before, during and after the event. THIRSTY? Mimosa specials plus purchase and enjoy beverages and cocktails of your choice. Our one of a kind snowman project includes: a white distressed 24″ x 14″ pre-painted pallet board, 12″ corrugated re-purposed metal snowman (from a 100 year old barn in Nebraska), assortment of scarf choices, wood snowflakes, stick arms and OVER 10 winter stencil choices. Warm hearts and frosty nights, Ready. Set. Snow., Love doesn’t melt, Winter welcome, Welcome friends and snowflakes, There’s snowplace like home, Snowman warm our hearts, Snowballs for sale 5 cents AND many more!